It's difficult for me to imagine the Ffestiniog Railway without Campbell's Platform as this was my first sight of the railway. But Mr Wilcke from Denmark took some photos in the 1950s and Andrew from the FR has kindly forwarded them to us. 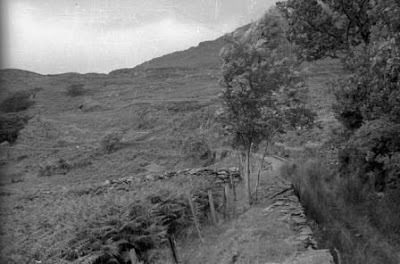 This photograph shows the reeds growing well out of the track and bracken thriving. The tank of tank curve is hidden by a tree. Conspicuous by its absence is the conifer plantation, planted with larch after the land was acquired from the Oakeley estate. That aspect of the view is about to be reversed with the felling of the Phytophthora ramorum infected trees. The oak trees to the left of this photo will be revealed once more after the larch has gone. I was hoping to see Ffestiniog rolling stock in action moving the harvested timber but alas their bid was not as competitive as a haulage company.